So you’ve been wondering about buying an MV Agusta? The MV Agusta Brutale 800 is one of the most affordable ways of becoming an MV Agusta owner but not via the pre-owned channel. Remarkably, from the already striking base model, showcased here, you will find a distinct difference in the components and workmanship as opposed to the other mainstream naked 800s on the market… then, there are also that artistic, exotic look and the unique MV Agusta sound! If you are one of those riders who likes to hear the bike that you are riding do its thang, well, the MV Agusta exhaust note and induction snarl will compel you to just get one… and that’s even before you perform any exhaust modifications! You might have heard all the good and the bad through the “My mate’s got a friend who has one and they told me that blah, blah, blah…” grapevine and the opinions vary. One thing is for sure, whether you are buying a KTM, Bimota, Ducati, Aprilia or an MV Agusta, if it’s not mainstream, there will be plenty of talk. BE READY!. If you are after specs such as frame material; gear ratio; torque, horsepower and the disc brake diameter etc. you can find plenty of information online. But if you want to know how it rides, not so that you can get to the lunch destination 0.3 second ahead of your fast riding mates, here is our description of how it rides. MV Agusta in general, provide a more stiffly padded seat (and, of course, is an integral part of the overall bike design), which feels in synch with the non-spongy suspension that they have always been known for – rider v/s road feedback is a universal characteristic of contemporary Italian motorcycles. 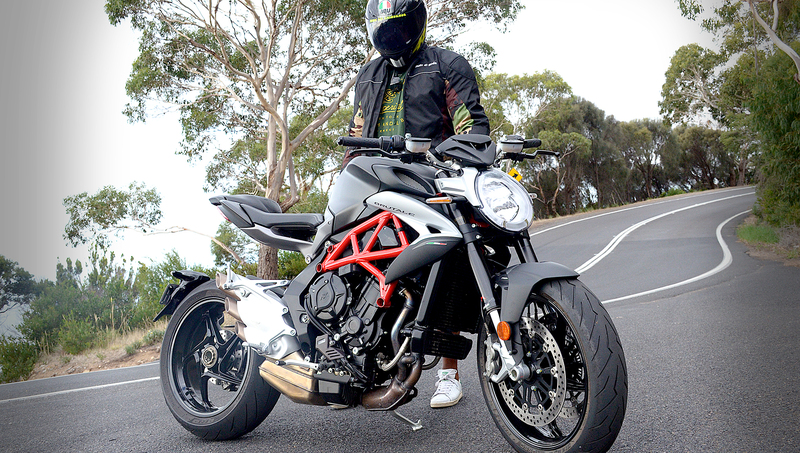 Having ridden the more mainstream motorcycles where you do not feel the bumps that you have just hit, on the MV Agusta Brutale, you will feel the road; gently (nothing teeth-shattering or anywhere near), but this exotic italian bike is no spongy taxi. It’s a riders’ bike – upright and more comfortable than the supersport or superbike style bikes, this Brutale is nimble in steering and throttle-responsive without being snappy. The Brutale 800, in our opinion, would be ideal for the rider who seeks comfort during a long ride without the need to stretch your neck, back or wrist at each stop or red light. This bike is super-comfortable. If you have a passenger weighing 80kg or less that would be riding pillion with you on a regular basis, the 800cc has plenty of torque to deal with the extra weight on take-off or if you need to accelerate to overtake a slower car. The MV Agusta Brutale 800 would also capture those who fall in love with its sound as well as something completely different in aesthetics when compared to most other naked bikes in the same class. Single-sided rear swing-arm; triple exhaust tips for the muffler; Brembo brakes; Marzocchi upside down telescopic fork; Sachs rear shock absorber with many adjustments; super-smooth quickshifter and much, much more. Contact us for more info or to take a demo for a spin before you’re hooked! 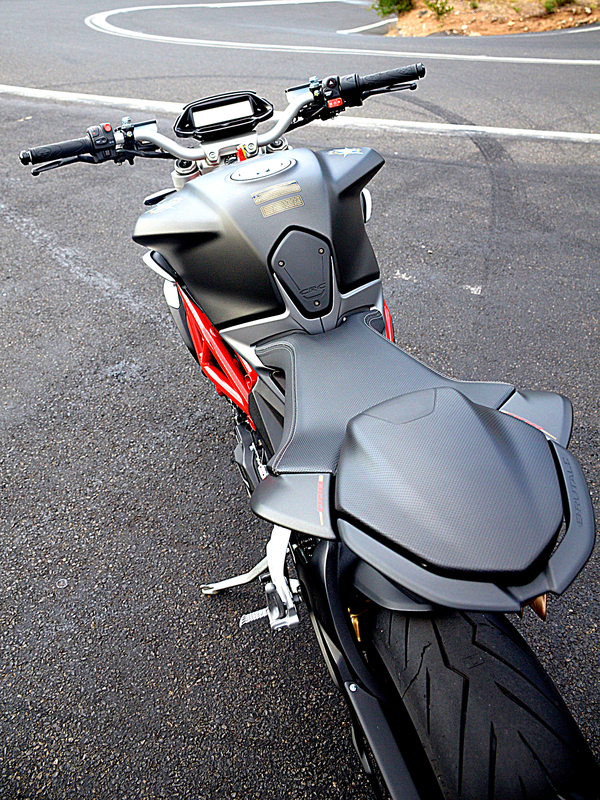 You can find more info about the MV Agusta Brutale by clicking here.